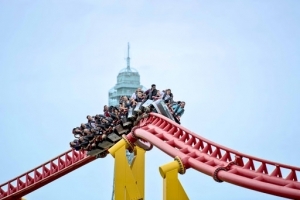 Are you looking for cheap Kings Dominion tickets? You’re in luck! When you contact aRes Travel, you’ll get rates that are so low they can’t be published online! Kings Dominion is Virginia’s premier roller coaster park! Just a short drive from Richmond and the Washington, D.C. area, you’ll find endless thrills in Kings Dominion’s themed areas, like International Street, Candy Apple Grove, Safari Village, and Old Virginia. Peruse the shops and take in an eclectic selection of shops on International Street, where you can ride to the top of the Eiffel Tower to get a bird’s-eye view of the entire park. Explore Old Virginia’s old-time Appalachian theme and ride the Grizzly, a classic wooden roller coaster that will have you gripping the lap bar and holding your breath. In Candy Apple Grove, hop on the Apple Zapple, a wild mouse coaster with turns so tight, you’ll scream through them all. Finally, reach Kings Dominion’s Safari Village, where the monster coasters live. Here, you can ride the Anaconda, a custom looping coaster with an underwater tunnel. You will also find the Backlot Stunt Coaster, a high-speed chase sequence based on the movie The Italian Job, and the Intimidator 305, the tallest giga-coaster ever built! Kings Dominion is also great for kids. 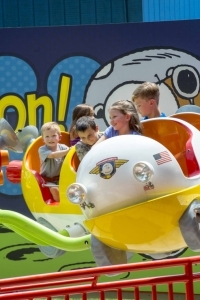 At Planet Snoopy, Kings Dominion’s smallest visitors can ride the Flying Ace, drive rail-guided cars across a pond in Peanuts Road Rally, take a spin on the Flying Ace Balloon Race, or experience their first coaster on the Woodstock Express! For exclusive deals on cheap Kings Dominion tickets, amazing savings on packages and hotels, call 1 (800) 434-7894 (international callers use +1 (619) 546-5622) to speak with an aRes Travel planning expert seven days a week, or book online now.